Are you single? Do you love to ski or snowboard? Are you looking for a new way to meet people? Then put down Tinder and come try Skied Dating, happening Feb. 10 at Whitewater, and Feb. 14 at RED Mountain Resort! It is speed dating Kootenay style. Skied Dating arose in answer to the challenges of dating in a small town, and dating in general. How do I meet people? Will we have enough to talk about? What if we have nothing in common? Does he/she want to see me again? All those questions are taken care of. We provide the venue for meeting, your “date” is a ride up the lift so you already know you both like to ski/board, and if all else fails you can talk about the snow. At the end of the date you fill out a form and check off who you would or would not like to see again. If they want to see you again too, it’s a match! We let you know via email if you have any matches and then it’s up to you to take it from there. 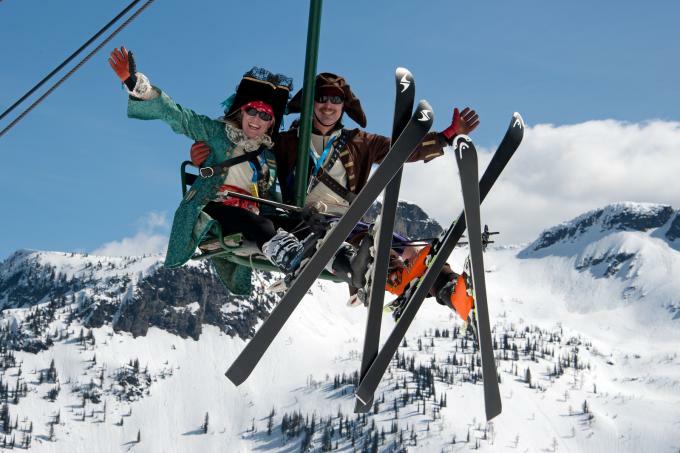 This will be the fifth year that Skied Dating has run at RED Mountain Resort, and the third year at Whitewater. “We ask that people register in advance for the event, as it makes it easier to set up dating groups,” said McClary. “We have quite a few registrations already, and I am excited to see the increase in female participants this year.” It is no secret that the ratio of males to females in ski towns tends to be a bit skewed, so it is great that the ladies are getting out there and taking part! The Whitewater event will take place Sunday afternoon from 12:- 4 p.m., and the RED Resort event at night skiing from 7-9 p.m. After the lifts close, both events will also feature post-ski minglers for participants to head inside, warm up with a drink, and chat with people they may not have had a chance to ride the lift with. As well, any people who “match” will be entered in a draw to win a date donated by local restaurants so they can continue to get to know each other. At Whitewater the date has been donated by Torchlight Brewing Co. and at RED by Fuel Gastropub. “It is great to be able to continue Skied Dating at both resorts,” said McClary. “It helps expand the dating pool in our communities and gives people a chance to meet other skiers/boarders they may never interact with if it wasn’t for the event.” To encourage people to take part at both events we are offering discount registration fees- $10/ event, or $15 to do both. This cost does not include a lift pass, though both resorts offer reciprocal discounts for season pass holders from the other. We are asking people to pre-register if possible. You can pre-register by contacting Tara at skieddating@gmail.com or by visiting Guest Services at the resorts. There is also day-of registration from 11:00am-12:00pm at Whitewater, and 6:00pm-7:00pm at RED. Take a chance and give Skied Dating a try, with any luck you’ll never have to stand in the lift line yelling “Single!” again!